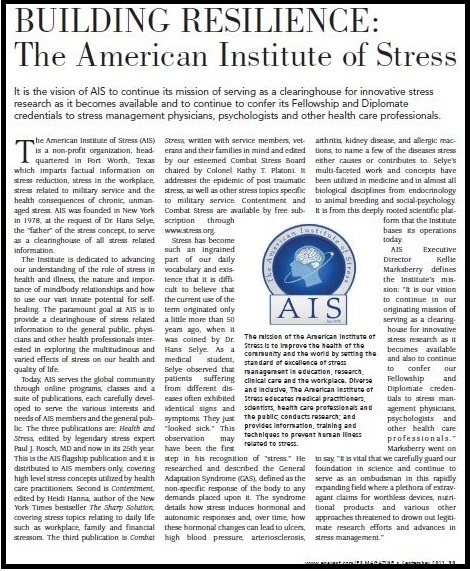 The mission of AIS is to improve the health of the community and the world by setting the standard of excellence of stress management in education, research, clinical care and the workplace. 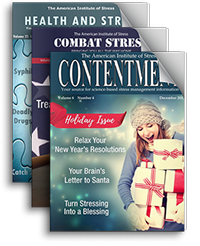 Diverse and inclusive, The American Institute of Stress educates medical practitioners, scientists, health care professionals and the public; conducts research; and provides information, training and techniques to prevent human illness related to stress. AIS provides a diverse and inclusive environment that fosters intellectual discovery, creates and transmits innovative knowledge, improves human health, and provides leadership to the world on stress related topics. THE AMERICAN INSTITUTE OF STRESS DOES NOT PROVIDE ANY CLINICAL SERVICES NOR ARE WE ABLE TO RESPOND TO REQUESTS FOR ASSISTANCE WITH PERSONAL PROBLEMS OTHER THAN TO SUGGEST RESOURCES THAT MAY BE HELPFUL WHEN APPROPRIATE.